In lieu of actual minutes, I am posting this summary of our first informal get-together. The first organizational meeting for the as-yet-unnamed NYCFC supporters' group was held this past Saturday, in the lower level of the Football Factory at Legends Bar. The basement, for those who've never seen a game there, can be curtained off into thirds by large supporter flags. We had the northernmost third, plenty of room for our group. My co-organizer Anthony, who tweets under the name NYCFC_SC, was stranded by Amtrak at school in Albany, so I chaired the meeting. I convened the meeting a few minutes after 12:00. In addition to the few dozen potential group members, we had three journalists in attendance: Nick Chavez of Soccer Newsday, Cesar Diaz, Editor-in-Chief for Latino Sports & ThisIsCosmosCountry.com and Peter Nolan of GotSoccer. Welcoming all who had come out to learn more and show support, I began the meeting by introducing myself and explaining that we had preferred an informal start to the group. I circulated a sign-up sheet to begin building a mailing list. I then asked the assembled supporters about the clubs they follow. We as a group follow mainly English football, but there was no clear consensus beyond that. We had Spurs fans and Arsenal fans, Liverpool and Newcastle supporters. We also had a handful of Manchester United fans, but tellingly only one Manchester City fan. That led me to my next point, a concern that the club be seen as only for Man City supporters. NYCFC is our local side, and should be able to be followed by all New Yorkers regardless of whatever other affiliations we have. I also explained that NYCFC had been invited to send a representative but declined. My impression, from conversations with them, is that they want us to develop the supporters’ group on our own, with only moral support coming from the club itself. This is, to my way of thinking, crucial to our future. We are not interested in becoming an "official fan club" but rather an independent voice for supporters. We have already begun the process of incorporating and applying for 501(c)3 status, meaning future meetings would be more formal, with minutes and an agenda. Not only will this be legally required, but I think it is necessary for our organization. As the group comes together, we will develop a website and members-only message board to facilitate communication between ourselves. It is crucial that lines of communication are open so that all voices may be heard. There is a great deal of interest in our eventual stadium atmosphere; songs, chants, tifo and the like. We expect this to grow organically over time, beginning out of these casual conversations. We will create a strong brand that speaks to the culture of our city. NYCFC's crest and colors are expected to be unveiled via fan vote next month, and once that is in place we can start to be begin the process of branding our group with a name and logo of our own. That gave me an occasion to lay out some of my personal hopes for both the supporters’ group and NYCFC itself. It is my hope that the club makes a bold statement of independence from Manchester City with their branding. Personally, I don't mind any use of sky blue, provided they continue to pair it with Yankee navy. One color from each of the parent clubs to create something new and unique on the New York sports scene. The crest, however, has to be more than just a modified version of Man City's shield-over-eagle. The general consensus of the group Similarly, we as a supporters group should choose an identity that speaks to our connection to the club and the city without restoring to "New York City FC Supporters". Speaking only for myself, I would rather see an independent name, more "Sons of Ben" than "Timbers Army". I'm also looking for something inclusive, so no "Boys" or "Minuit's Men" or the like. The first MLS club in New York City proper will draw a great deal of attention, and even small mistakes will be magnified in that bright spotlight. In addition, immediate success will be expected and taken for granted. NYCFC will have to win over fans of other clubs. 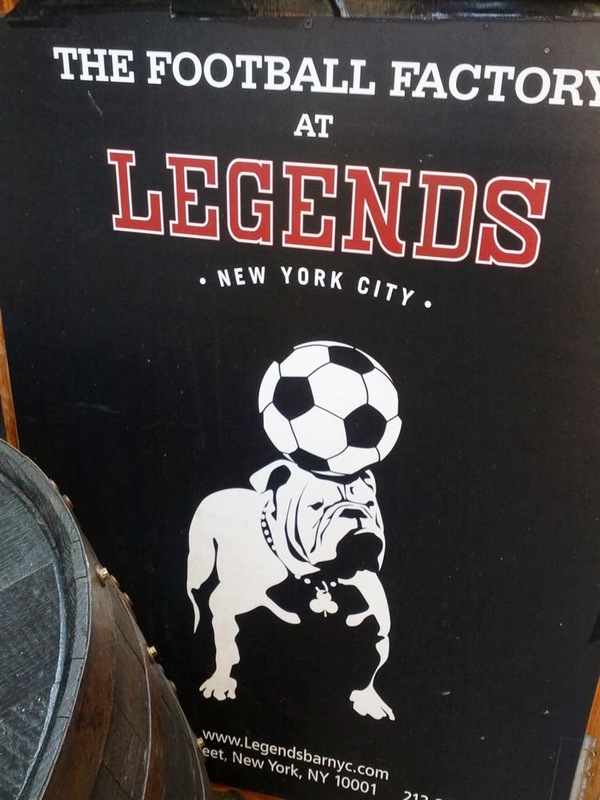 The league has failed to establish any significant presence in New York City since its first games in 1996, and that coupled with the rise of international broadcasts has meant our native soccer fans have gravitated to the world’s greatest clubs. We need to encourage fans of foreign clubs from Boca Juniors to Arsenal to Juventus to support their local side. This is, in part, why it’s so important that the club’s independence be stressed. On the other hand, there is tremendous potential. New York City is fertile ground for the sport. Soccer is enjoying record popularity among kids in the five boroughs, with nearly 100 youth leagues in the city alone. An untold number of kids pick up the sport every year, a growing pool NYCFC can tap for support. MLS has given fans in New York an amazing opportunity to get in on the ground floor. How many Yankee fans got to experience their team’s early days first-hand? Our pro sports teams have histories stretching back decades if not a century or more. NYCFC is that rare chance not only to watch a top-level sports club begin in our city, but to help build that club’s culture from the ground up. In that vein, as we move forward, there will be many opportunities for fans to get involved with our supporters’ group. That involvement could be as casual as meeting up to watch road games or as extensive as becoming an officer and shaping organizational policy. I am expecting our members to step forward and volunteer their talents, which will be made much easier once we have a message board. I closed the meeting by thanking everyone for attending, and we broke into small discussion groups. The time and place of the next meeting will be announced in the coming weeks. Unfortunate for NYCFC_SC that he could not make it considering his contribution thus far. Anyway starting with location. Presumably meetings will take place on non matchdays at Football Factory/Legends from this point onwards? I've never really liked the idea of holding meetings such as this in bars but here could be a notable exception partly due to theme. It certainly helps image wise to meet in such close proximity to a building of that stature and reputation. Infact a great photo opportunity for the group could be taken at the top of the Empire State. This could happen at the next meeting though I don't know whether people need to pay to go to the top so maybe that would rule it out. The pic in the bar is fine but a group pic at the very top would probably get far more clicks. 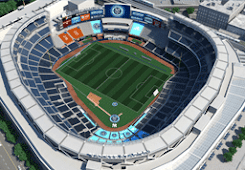 I'm guessing nobody will meet on matchdays at that facility (I don't know how long it takes to get from Manhattan to the Bronx) and somewhere closer to Yankee Stadium probably would make sense. Still I suggest non matchdays continuing to meet at Legends/FF. The journalists present help especially due to their ability to attend club press conferences. For instance Nick Chavez (and his other namesake) attending the recent Kreis press conference. Disagree with NYCFC over not sending a rep. It does not mean any notion of "officialdom" but at some point in future tough questions may have to be asked. If the club ever organise any kind of official fans forum (different concept to a supporters club) that would be the time to bring up such points. For instance (and just one example) Quarino's past with Red Bull and thoughts on their extreme incompetence over not marketing NY. Extreme incompetence is strong but extreme incompetence is what it is. 2.By members only does that mean guests can't post or does it mean only people signed up as official member of the group can join? 4. Yes it makes sense to wait until after the official logo. Still think something more raw/gritty than shiny and corporate (not that there's much long with that) would be a good symbol. No better color than blue far as I'm concerned and it would be my colour of choice had MCFC been connected or not. Is the "New York City supporters" still going to be the legal name (kind of like how companies have a legal name but often a different public name) or is it going to be nickname from legal to everything else? 1. Club will be held to high standards but the challenge will be embraced. Of course there's nothing much the SC can do to influence on field performance but being the biggest and best MLS related supporters group is a challenge in itself...and that should be embraced. "Thinking big" has been the motto of many great people. 2. I did bring up the stadium atmosphere myself on the nycfcfans forum post. Can you elaborate a little more on how that discussion went? 2. FROM THE BEGINNING. A point that needs to be emphasised over and over again and how unique it is in this day and age. Every promotional thing put out by club and SC should emphasise this. Its certainly been one of the major factors that appealed to me besides what a great city New York is. That could be used as some kind of slogan for the group though I've said previously the Bronx motto "Ne Cede malis" fits (yield not to evil) and not just because its the Bronx motto it fits generally. I will send a few other pms on twitter. Also suggest this blog allows guest posting as I had to register with wordpress just to post this.